The 'Cave of Altamira and Paleolithic Cave Art of Northern Spain' feature drawings and polychrome rock paintings of wild mammals and human hands. The site consists of the famous Altamira Cave, with its Chamber of the paintings ('Sistine Chapel of Prehistory'), and 17 other caves in Northern Spain. 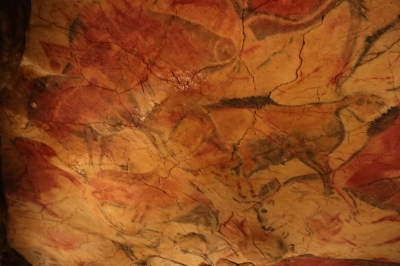 During the 1960s and 1970s, the paintings in the Altamira Cave were being damaged by the damp breath of large numbers of visitors. Altamira was completely closed to the public in 1977, and reopened to limited access in 1982. Very few visitors were allowed in per day, resulting in a three-year waiting list. At the present time, a study is being made of the conservation conditions inside the Cave of Altamira, so it is NOT possible to visit it. A replica cave and museum were built nearby. When I first became aware that there exists such a thing as 'World Heritage', the Altamira Cave rose quickly to the very top on my list to visit. Such a magnificent, but also exclusive, site. You had to pre-book a visit 3 years before! One day I’ll go there, I thought. I’ll just reserve a spot, and travel there to see this work of art. But what happened? The cave got closed to the general public entirely in 2001! Years and years (and many WHS) later, I stayed for a couple of days in Llanes, a town close enough for a trip to Altamira. One can visit only a replica nowadays, and since 2008 other palaeolithic caves in the area have been added to this particular WHS. So the Altimara Cave isn’t so unique anymore. However I noticed at the official Altamira website that it is even possible / recommended to pre-book your visit to the replica cave too! On a Saturday in August, I decided to take my chances and just show up. I arrived at 9.50, early enough to beat most of the Spanish who don’t seem to get going before 11 a.m. Buying a ticket was no problem then. Entrance to the museum is free, and you pay 3 EUR for visiting the replica cave. You’re only allowed into this what they call ‘New Cave’ at a fixed timeslot, in groups of about 40-50 in a 10 minute interval. They do build up the expectations with a large door that opens up and a video. But what a disappointment the rest is! It is fake and it looks like it. The famous Chamber of the paintings has been reduced to a corner in a museum setting. I seriously thought that the 'replica cave' still had to come, when I saw the Salida (Exit) sign. To wash away the dirty taste, I decided to go and visit another cave in the inscribed area. A lot of the others are either closed to the public too, or have strict limits on visitor numbers so you’ll have to pre-book or be early. I had done some research beforehand, and had decided upon El Castillo which didn’t appear to have these limitations. 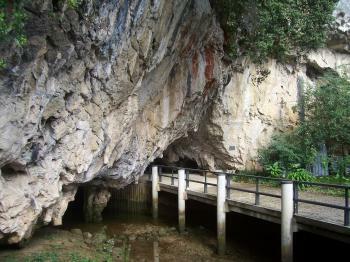 The El Castillo cave system is located just outside Puente Viesgo (20 min from Altamira). And fortunately: Yes, this is a cave as it ought to be. The interior is cold, dark and slippery. It is quite a large cave system and dripstone has formed abundantly. For 3 EUR you get a 45 minute tour by a guide in a small group of about 15 people. The guide points out the paintings with a light. Bisons in various sizes and postures. Symbols. And hands, lots of hands. I thought these only existed in the Cueva de los Manos in Argentina but they are quite common among palaeolithic cave paintings. I'm glad I got to see those. P.S. : I'd love to read a review of this WHS by someone who has been into the "real" Altamira cave (before 2001)! I visited Altamira as part of my mad dash across souther France and northern Spain in April 2018. I was intrigued by the opportunity, that Altamira museum has been practising for the past couple of years, to visit the original Altamira cave. I stayed at nearby town Santillana del Mar, which in itself is very picturesque sight and boasts church Collegiale de Santa Juliana from 12th century which is part of the inscribed routes of Santiago de Compostela WHS. In the morning I drove to the museum of Altamira (2 km away) at the opening time 09:30, where a decent crowd was already stepping anxiously in front of the gate. It was the day of the Lottery. The Lottery works like this: Every Friday everyone above the age of 16, who bought a ticket to the museum between 09:30 and 10:30 is eligible to participate. You need to read and agree to the conditions (for example that you will change into special protective clothing, will not touch anything or take pictures of anything, etc. ), fill in a short form with your name, passport/national ID number and telephone and toss it into good old fashioned draw box. Five lucky winners then get to visit the original cave. If you have arrived at 09:30 you have plenty of time to view the replica of the cave and visit the rest of the museum. At approximately 10:40 the draw begins and the suspense is intense. It reminded me of times at university when results of exams were announced. About 100 people gathered and awaited. Five lucky names are called in quick succession, people clap a little more less sincerely every time someone from the lucky ones show up to check ID. If anyone is not present the telephone number they have left is called and in five minutes in case of no show additional form is drawn from the box. Five visitors depart to change and to visit the real cave straight away. Unfortunately my name was not drawn, so a little sad I checked the locked entrance to Altamira cave, which is 200 meters behind the museum. Afterwards I did the next best thing and visited one of the other inscribed caves - El Castillo. It is about 18 km away in Puerto Viesgo. Guided tour is required to visit the cave, but luckily one group was just departing into the cave and had one more spot available. Inside you can see original paintings of bisons, negative hand prints, unidentified signs, although all not as impressive as the ones in Altamira. Hopefully, next review that is going to be above me will be of someone, who managed to win and visit the original cave. Good luck! In the winter of 1964, a friend and I hitchhiked along the northern coast of Spain with the goal of seeing Altamira cave. We were dropped off and walked about 1/4 mile to the site, only to see sign saying in Spanish, "Closed for the season." After we had lingered there sadly for a few minutes, an old man came out of a nearby dwelling with a big flashlight and said, "I'll show it to you." He unlocked the door and took us in. This was the most sublime experience of art in my life. The drama of the buffalo raging across the ceiling [and perfectly adapted to the bulges of the stone] moved and impressed me. The thrill I felt has scarcely subsided after 50 years. I visited this WHS in August 2014. After learning that the Altamira Cave was closed to the public and that it was only possible to visit the replica museum, I decided to make a reservation online to visit the group of caves of El Castilo, Las Monedas and Las Chimeneas inscribed together with Altamira. I opted for the first visit in the morning on a weekday to avoid tour groups and indeed I was lucky. The guided visit was in Spanish but I was able to follow the gist of what the guide was saying and anyway my main purpose was to visit the actual caves and to see the original paleolithic art illuminated by the guide's torch. 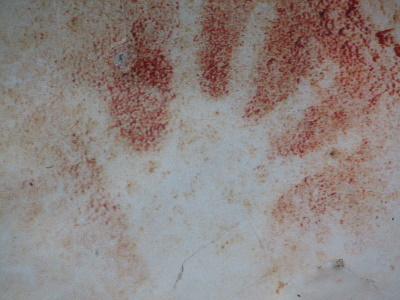 The main highlight of the El Castilo cave were the hand impressions while the highlight of the other caves were animal paintings of deer and bisons. Photography is not allowed but I managed to take a short video of the hand impressions as I exited the cave and a couple of photos too which I'll treasure knowing that sooner rather than later the original caves will have to be closed to the public to avoid damage caused by fungi diseases. I enjoyed my visit mostly because I managed to see the original paleolithic art this time round, however I must say that the Lascaux cave drawings are more elaborate (even though what you see is a replica). I visited Altamira in the late 60's and for the price of the equivalent of $3US hired an official guide for a day who took me through all the locations open to tourists which were stunning beyond ones imagination and a very spiritual experience. We then proceeded to go deeper into the complex with our own flashlights and crawled through fissures and saw petroglyphs and finger drawings in the mud floor. While living in Germany from 1969 through 1977, my wife and I travelled extensively througout Europe. On one of our trips in the early 70's, we drove north from Madrid toward Santander, intending to follow the northern coastline back into France. Early one morning by chance I happened to notice a small sign referring to the Altamira caves. On a whim we pulled into the indicated parking lot and waited an hour or so for the elderly guide to show up for the morning's first tour. No more than a dozen of us took the tour. I must say it was one of the most moving experiences of my life and certainly a highlight of our time living in Europe. I remember entering a relatively large anteroom near the front of the cave and then being led back into a much smaller chamber. (I only recall one chamber beyond the anteroom, though there probably were more.) A path had been dug out around the walls leaving a waist-high (or perhaps chest-high) plateau in the middle of the room that we had to squeeze around. Although I had seen photographs in the past of cave drawings, I was completely unprepared for the impact the originals had upon me. What struck me most was how creatively the artist(s) exploited the contours of the wall. In a two-dimensional photograph you get no sense how the bulges in the rock surface were incorporated quite imaginatively and intricately into the bodies of the various animals. Standing only inches from the drawings, I somehow had a sense of the presence of the artist. I could almost see him (or was it perhaps her?) laboring over the drawings with only fire to illuminate the surface. And, of course, that sense of the presence of the artist was especially acute when I viewed the image of the hand (which presumably belonged to the artist.) All in all, the visit was a wonderfully moving experience that has lingered prominently in my memory for four decades. By the way, a few years later we were visiting the Deutshes Museum in Munchen and came across a simulation of that chamber at Altamira. You walked into a tunnel-like structure the walls of which replicated quite accurately the walls of the actual chamber. In fact, my wife and I were quite startled by how realistically the room was portrayed. Of course, the dampness and musty odor of the actual site were lacking, but other than that, we almost felt like we were back there. So I'm a little surprised to read that the replica located at Altamira today is such a disappointment. I would have to guess that it's not the same one we walked through at the Deutsches Museum. While I feel bad that my visit to the cave roughly 40 years ago might have contributed to its deterioration, I will always be grateful that I had the chance to view it first-hand. As it turns out, the tour was indeed a "once-in-a-lifetime experience." I visited the Cave of Altamira while traveling in Europe with two friends in 1968. We rented a car in Paris, traveled the length of Spain and finished up in Lisbon. One of my companions, who taught Spanish at a university in Virginia, suggested that we take in Altamira and another cave (probably El Castillo, since it was not far away)during our stay in San Sebastian. As I recall some forty years later, visiting the Altamira cave was very easy - i.e., it apparently was not a big tourist site at that time. Somewhere among my belongings, I have a postcard of one of the figures in the cave, but I think I purchased it in Santillana del Mar rather than on the site. In any event, the three of us had a private showing. A grizzled old man took our money and then led us in. I remember being grateful that it did not require going underground. Once inside, I was of course in awe, not only of the age of the paintings, but also of the delicacy and skill with which they had been executed. I think we tend to look down on our distant ancestors as primitive and stupid, but cave paintings like those at Altamira remind us that they were not. The artistic impulse was alive and well. Most modern art makes me think that we have regressed rather than advanced - a case of too much head and not enough heart. Of the El Castillo experience, I can only say that I was too freaked out by the dark and cold, and the fact that it was underground, to appreciate whatever there was to see. Also, we went in with a large group of tourists, so seeing anything up close was virtually impossible. After reading Els disappointment with a visit to the new copy of Altamira which correlated with some friends experiences, I decided to forgo a trip along to Cantabria and instead visited one of the Western most inscribed caves, Tito Bustillo, which was regarded as one of the four most important in the inscription. This was my first cognisant visit to a cave art site, so I don’t have much to compare it with, however I was massively impressed by the examples I saw. It was a long walk (1km) through a rather impressive cave, displaying all of the features one would expect, stalagmites/tites etc. We then got to a dark section of the cave and our guide shuffled us into position, she then shone her torch on the art and I must admit I joined in when the rest of the group gasped. The depictions of animals were limited but very impressive. Our guide proceeded to give a very thorough explanation (in Spanish, but I got the gist, and the movement of the torchlight made it very easy to follow) and show that there were many other faint representations with-in the gallery. Unfortunately it is not possible to reach the ‘Cave of Vulvas’ for which Tito Bustillo is particularly renowned (one of the earliest examples of art with sexual motivations), we were shown the access point to the cave system in which it lies and without proper caving equipment and a very bendy body it is inaccessible. 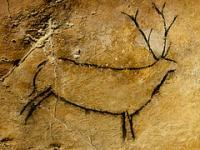 This was a shame; however I left my first dabbling with cave art wanting to see more. Tito Bustillo is located in the charming fishing town of Ribadesella, located on a great piece of coastline butted against the sea by the peaks of the Picos de Europa national park. The town also has a selection of Dinosaur footprints and is located on the Camino del Norte so has the remote potential of having 3 WHS. Even if it doesn’t get this accolade it is still a very charming and well connected town that I really enjoyed spending a sunny day in. The Cave art I saw at Tito Bustillo was really impressive and I would happily visit more sites based on this experience. This cave was regarded as one of the four most important in the inscription so I feel I have done the site some justice, but would happily return to visit more of the caves. You can only visit a copy of the original cave. Similar but much less spectacular than Lascaux. It's a tourist spot with a regular Juju-train from the near town of Santillana to the cave, so most of the time its crowded and noisy. Santillana itself is a nice town and the two Paradores are both a nice place to stay overnite when visiting the cave. Aurochs: In addition to the "famous" representations in Altamira a number of the other caves within this WHS also contain representations of Aurochs - e.g El Castillo, Tito Bustillo, Toro, Altxerri and Covelenas. Dubbed as another WHS: Altamira "The Sistine Chapel of Quaternary Art"
Unusual Entry Requirements or Restrictions: Entrance to the main cave is restricted to 5 persons a week, selected via a lottery. 116 Community Members have visited.